For Christmas this past year I decided to make the girls a tent. 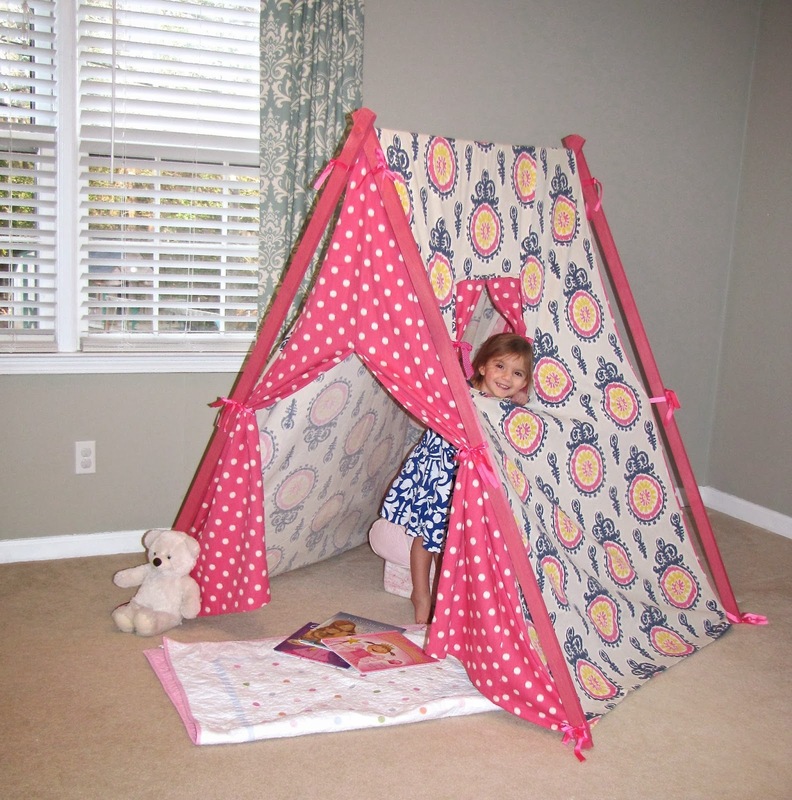 Claire had seen a little fold up tent at Target she wanted but since we have already been there, done that and it broke like a week later, I decided to make the girls something that would last a little longer. 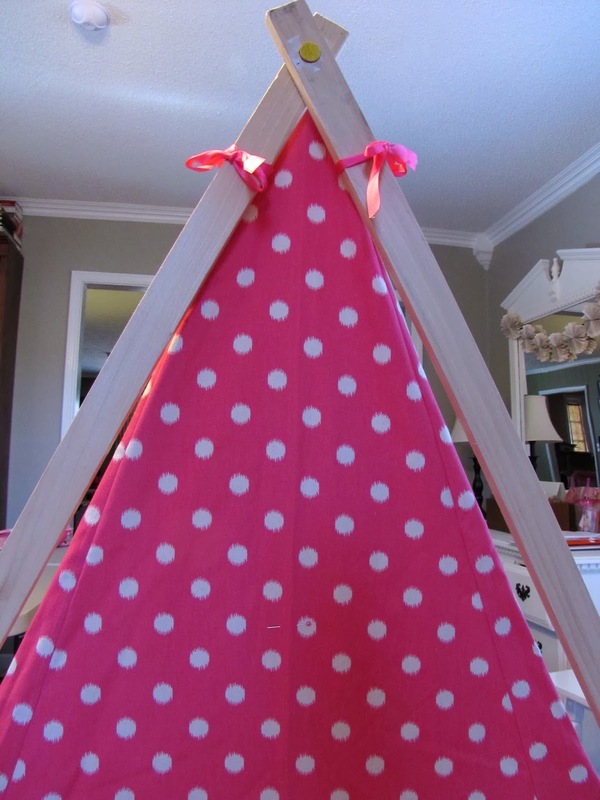 I saw the A-frame tents all over Pinterest that have the fabric draped over the middle but I couldn't find plans for something that was enclosed all the way around. I decided to go ahead and make something up. You can pretty much customize this to whatever size you need. 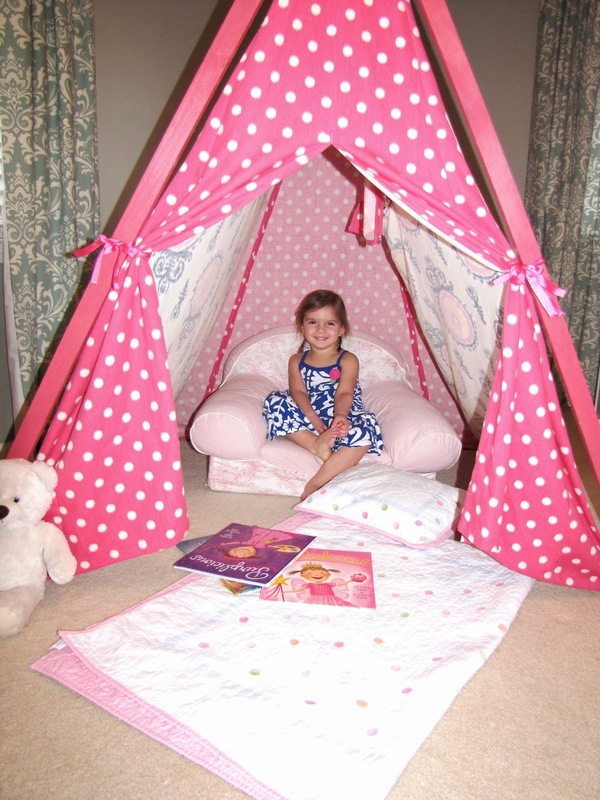 I wanted something big enough to fit 2-3 kids but not so big it would take up a ton of space in our house. Luckily, this folds up easily for when we need to move it out of the way. 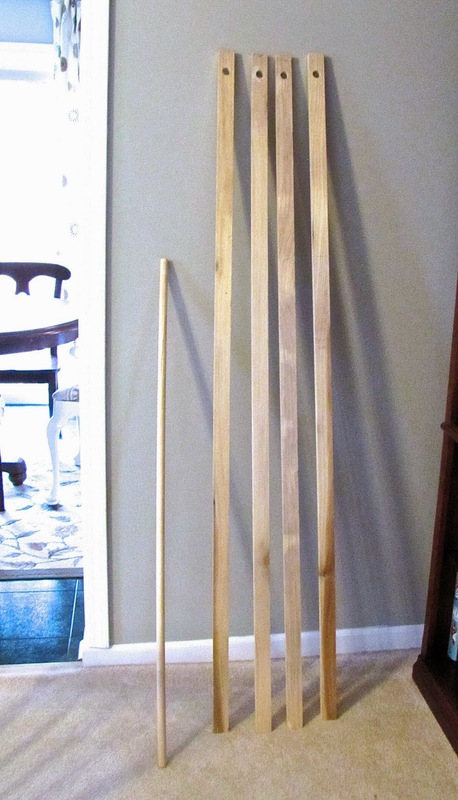 First, you will need to head to your local home improvement store and pick up the moldings and dowel rod. I just picked out the cheapest molding they had (I think it was pine). You pay by the foot and they will cut it for you if you ask nicely and smile real pretty. 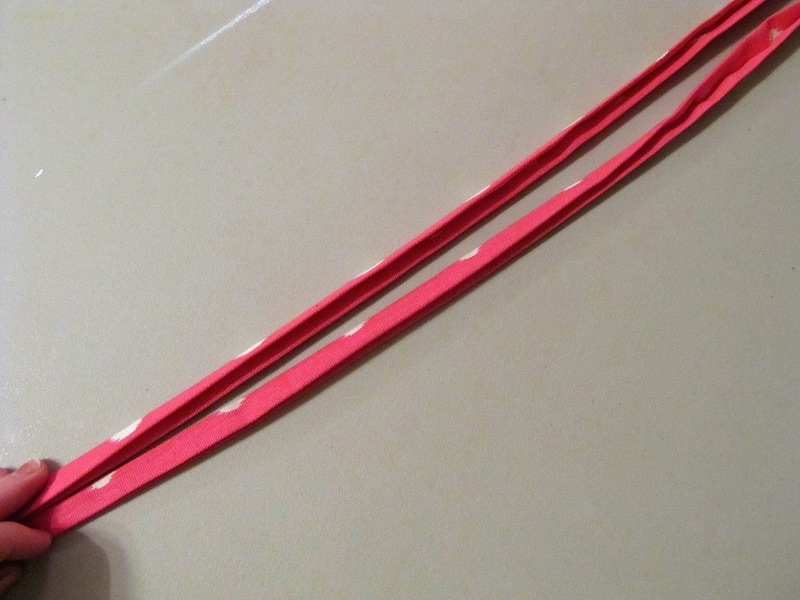 =) I cut mine each 66" long. Measure down from the top about 2" and using your spade bit drill a hole all the way through on each one. To put it together you will put one of the moldings on top of the other matching the holes at the top and push the dowel rod through it. Do the same thing to the other side and then spread out the moldings creating the shape of an A. You can spray paint them a fun color or leave them as is. Now onto the fabric. 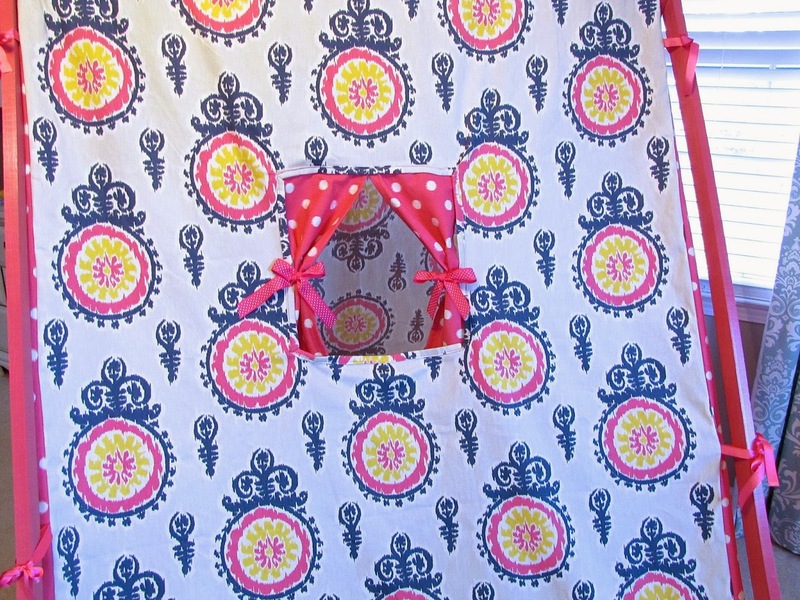 I used two different patterns--the polka dot is for the front and the back of the tent and the Ikat is used to drape over the dowel rod on the sides. 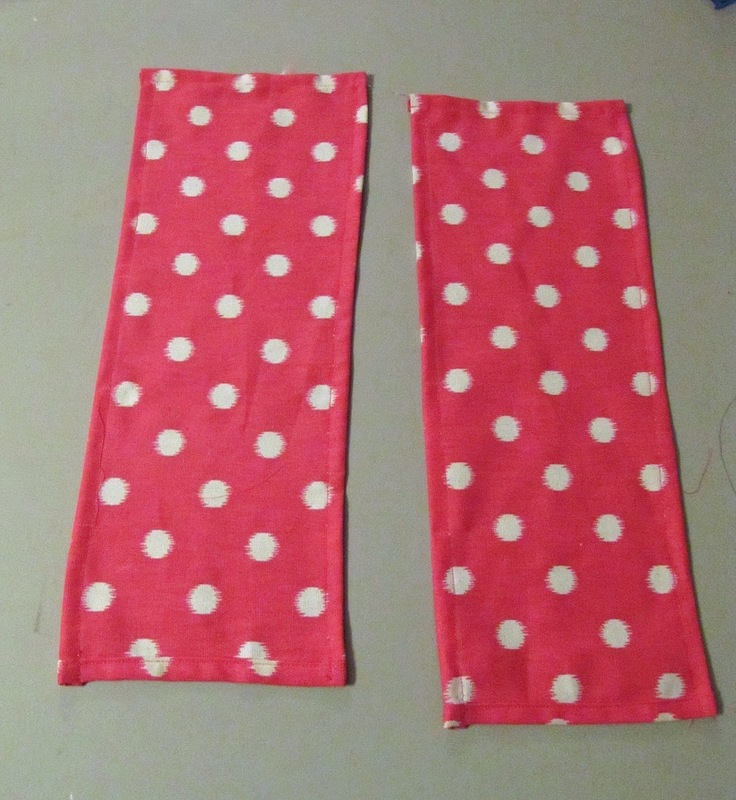 First, I cut the polka dot fabric into two sections two yards each. 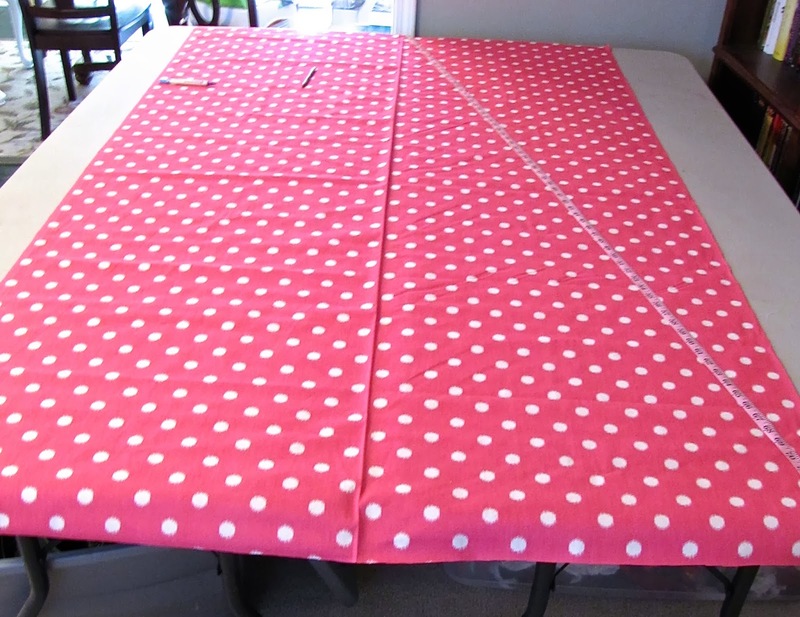 I laid out my first two yard section flat onto the table. Now you want to cut it into the shape of a triangle. I used the middle fold as my center point and laid my tape measure out where I wanted to cut with the top touching the middle fold and the bottom touching the corner point. 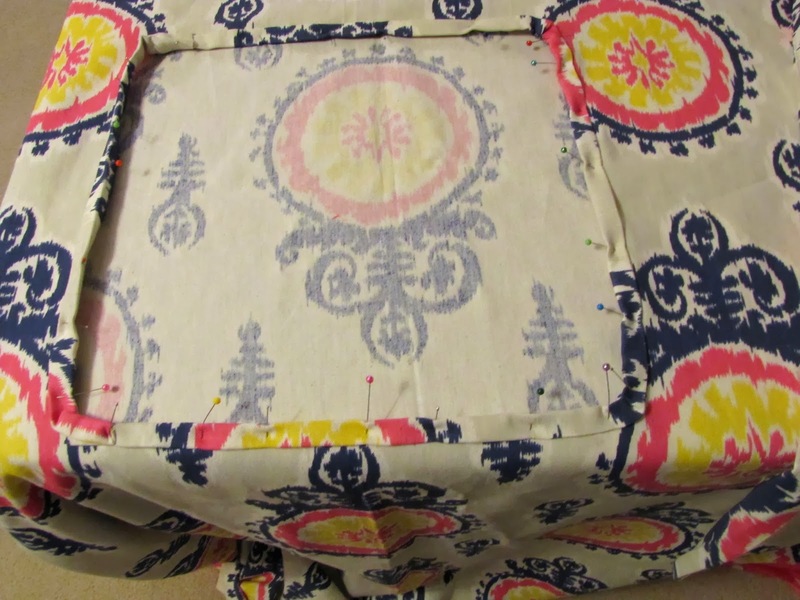 I pinned it to hold it in place at the top and the bottom points and carefully drew along the edge with a fabric marker to mark where I wanted to cut. I used the same method to mark the other side of the triangle. 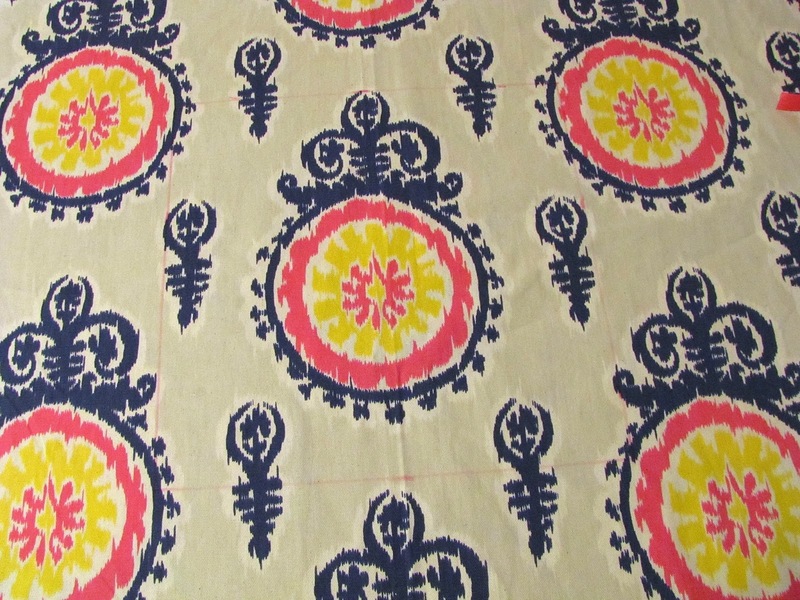 Cut out along your lines so your fabric will look like this. Then you're going to take each piece, flip it so the points are facing up and move the right piece to the left side and the left piece to the right side to make your triangle bigger. 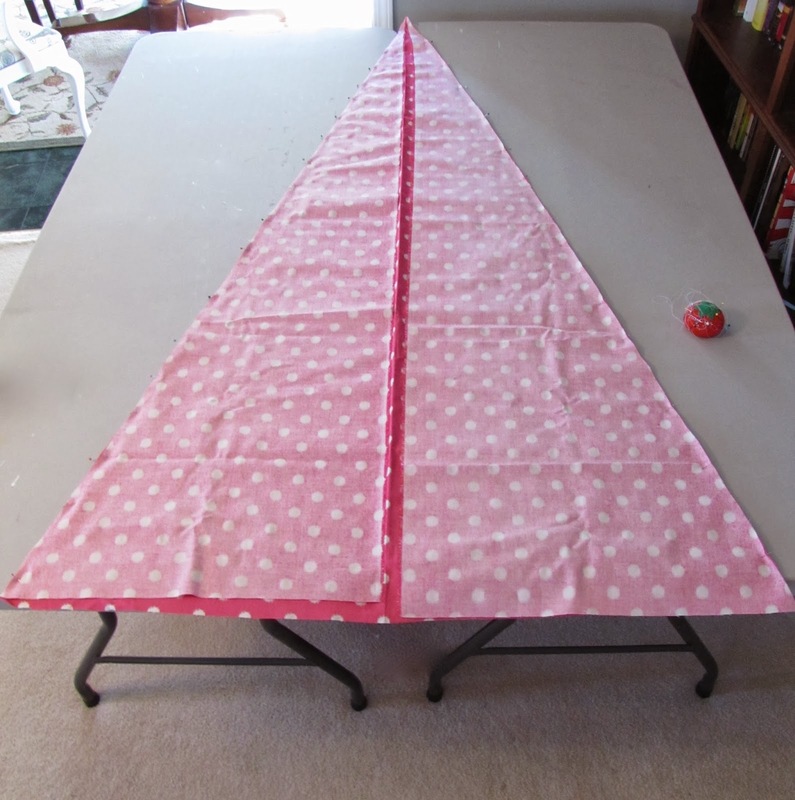 Now take the side triangle pieces and fold them over so they are face down on top of the larger triangle making sure to line up the sides. 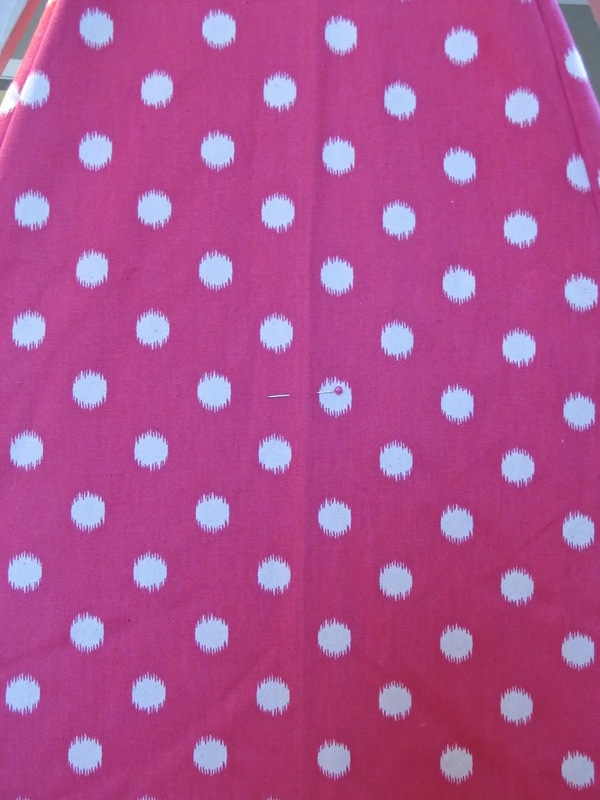 Pin in place along the sides and sew at a 1/2" seam allowance. So it will look like this. The bottom will not be straight but leave it as is because you will hem it later. 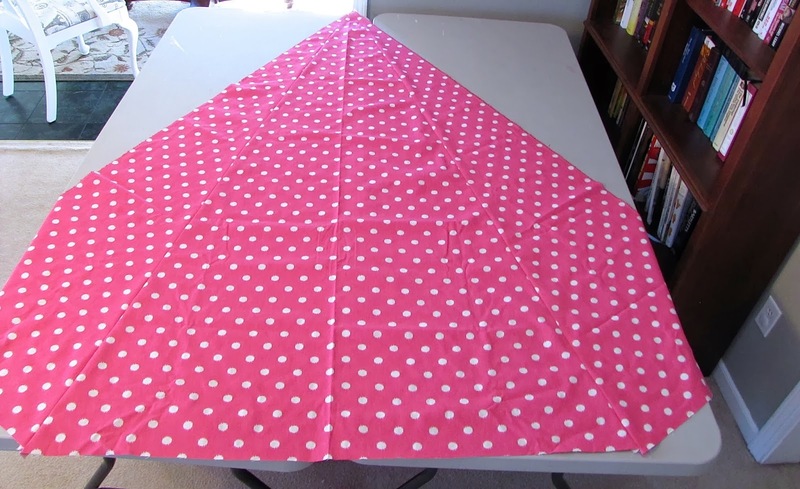 Do the exact same thing to the other two yards of polka dot fabric so you will end up with two triangles like this one. 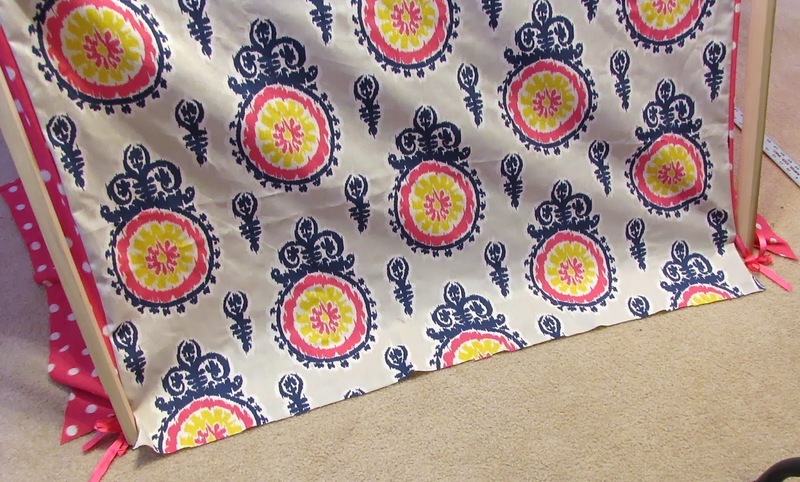 I knew how wide I wanted my tent to be (54") so I laid out the a frame on top of the fabric to the correct measurement and traced the outside edges of the molding with a fabric marker. 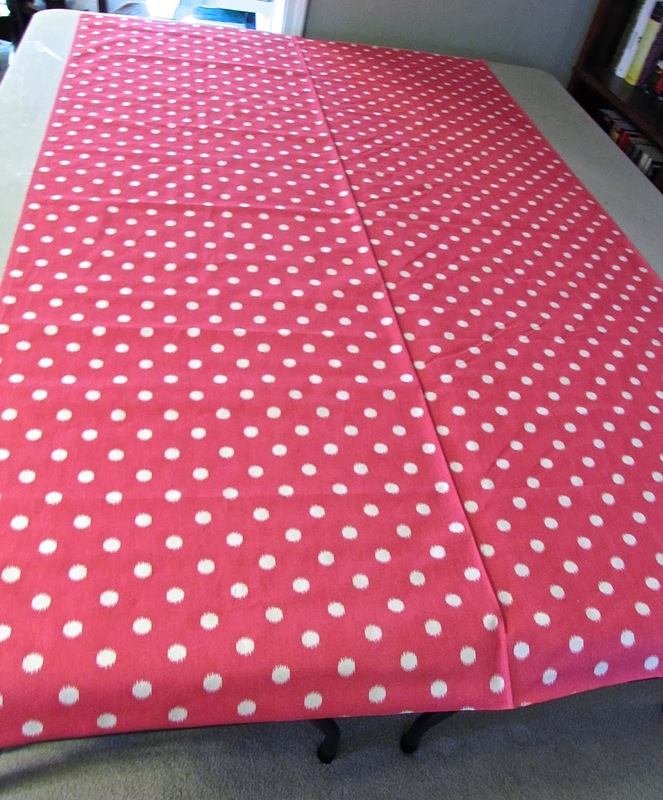 Make sure to line it up in the middle so the seams on the side will be the same size. 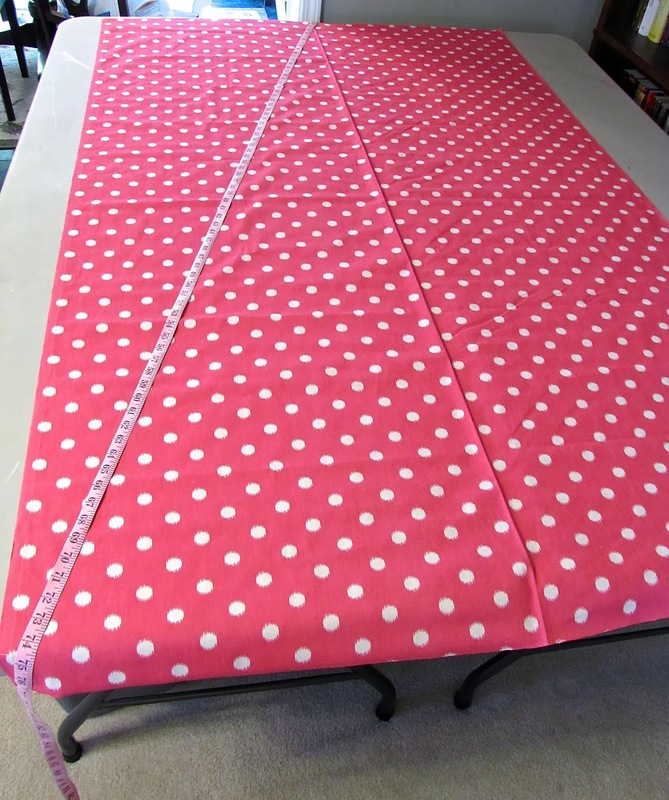 From where I had it laying on the fabric it measured about 67" from the bottom of the dowel rod to the bottom of the fabric. It measured about 54 1/4" from the outside corners of each piece of molding. 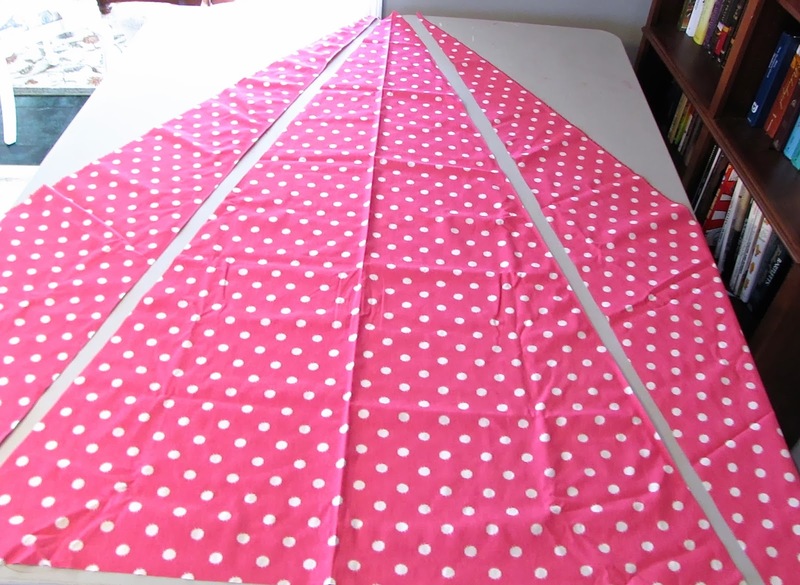 Cut out along the line that you just drew with the fabric marker and use that piece as a pattern to cut out the second triangle the same size. 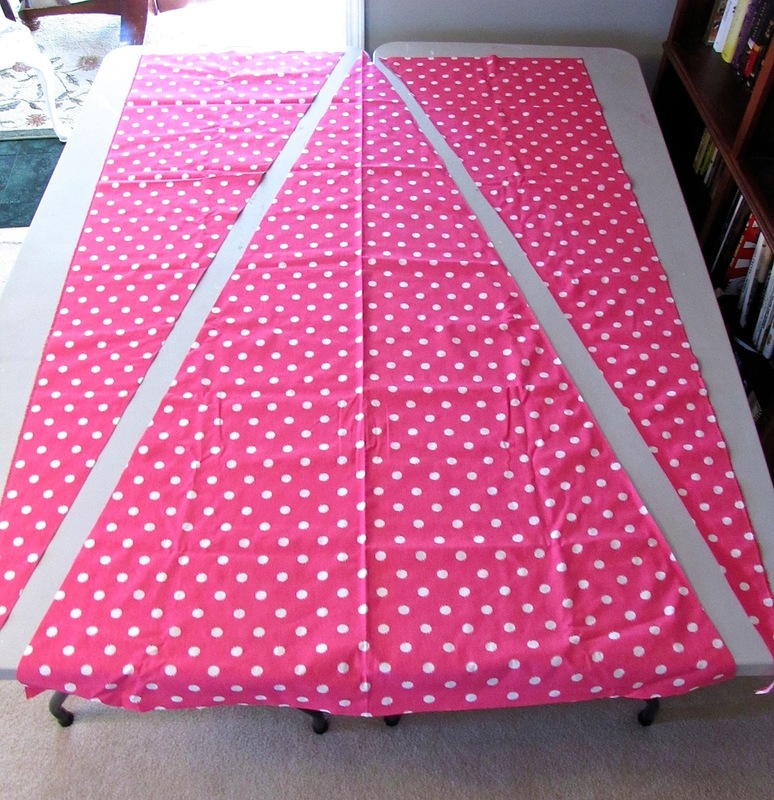 Now to attach the triangle pieces to the center fabric. 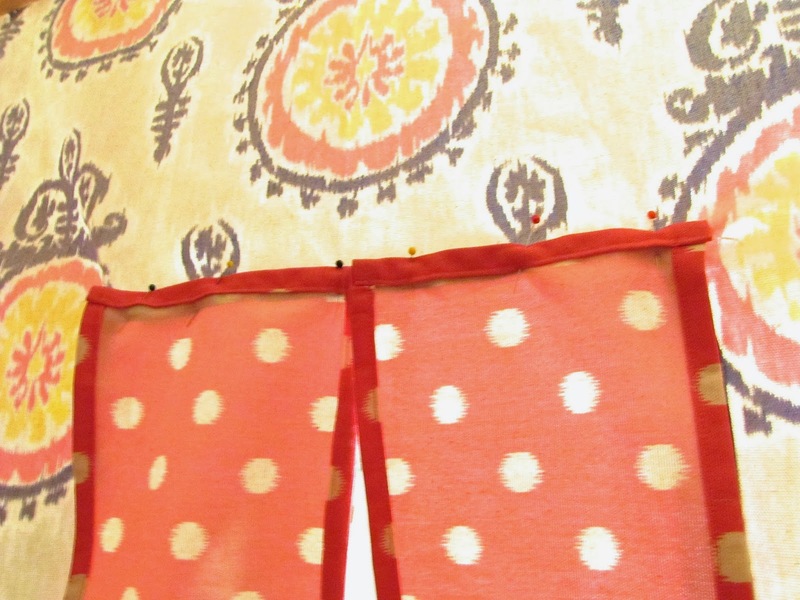 I set up my tent frame and draped the Ikat fabric face down over the rod so there was the same amount of fabric on both sides. 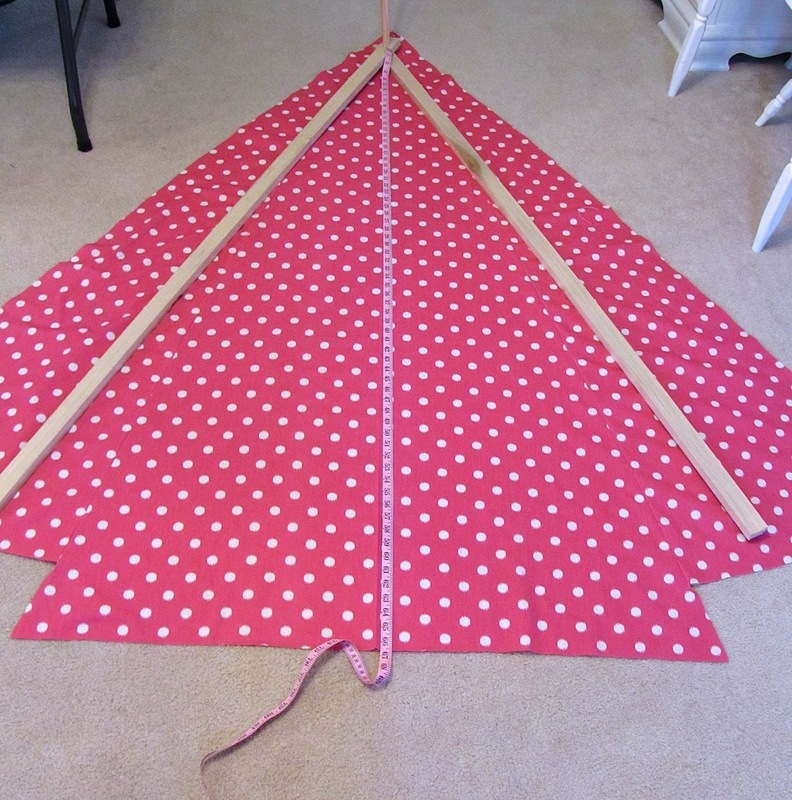 You will start by holding up the first triangle right side facing in and pinning it to the edge of the fabric draped over the rod. 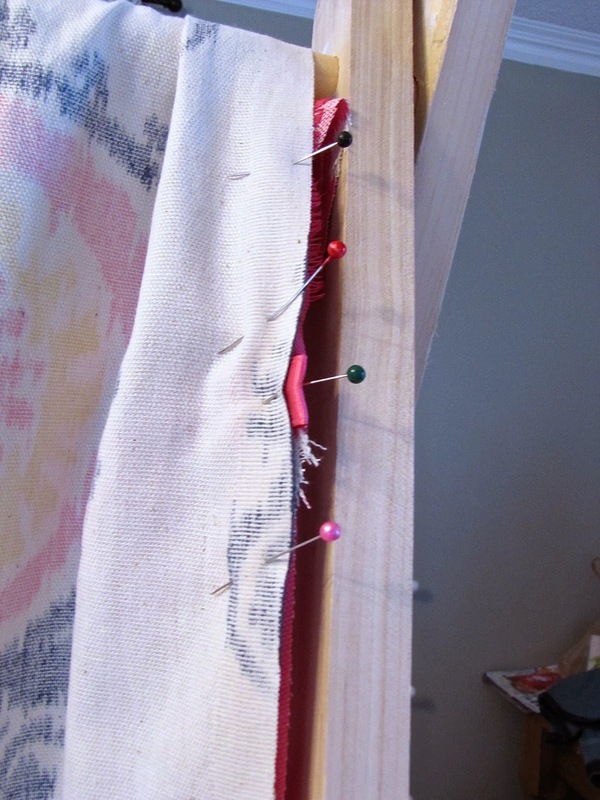 Leave an opening at the top of the fabric for the dowel rod. You can see in this picture where I slipped in one of the ribbons that will be used to tie the tent to the rod. 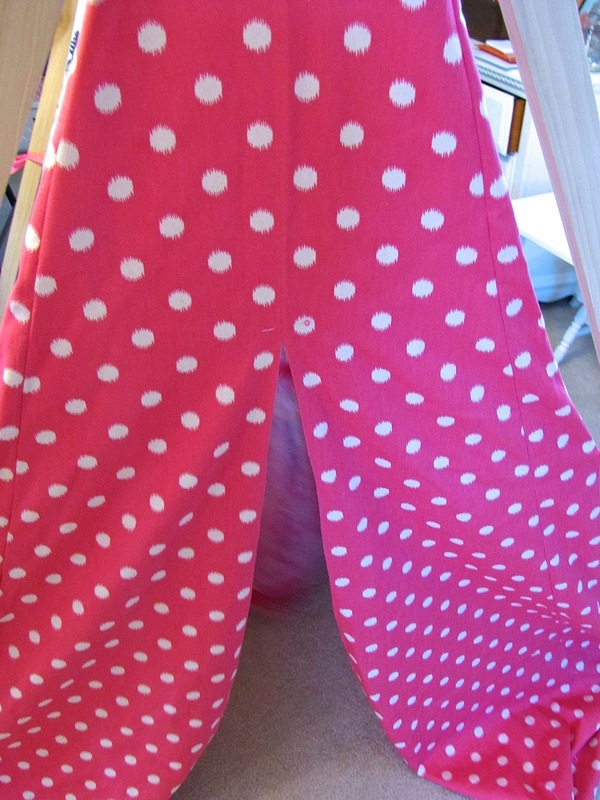 I sewed them right into the seams. 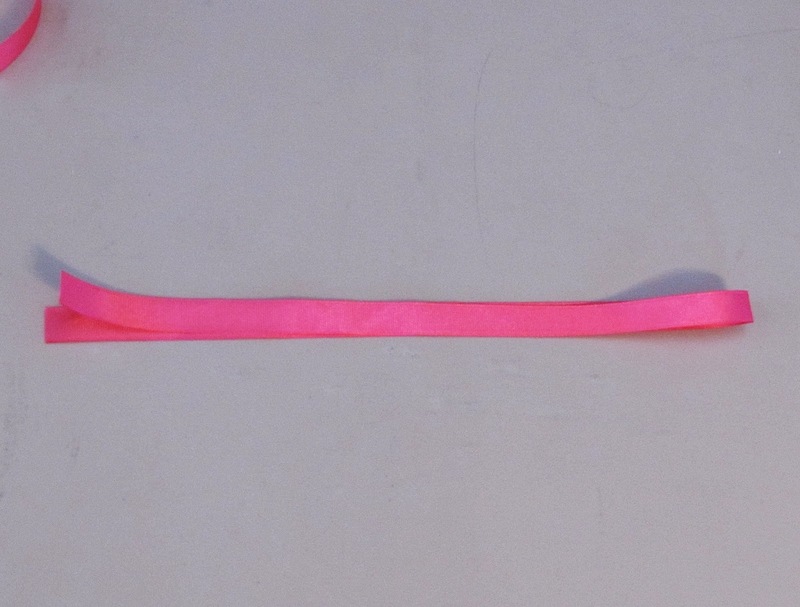 I cut 12 pieces of ribbon each 29" long and folded them in half. 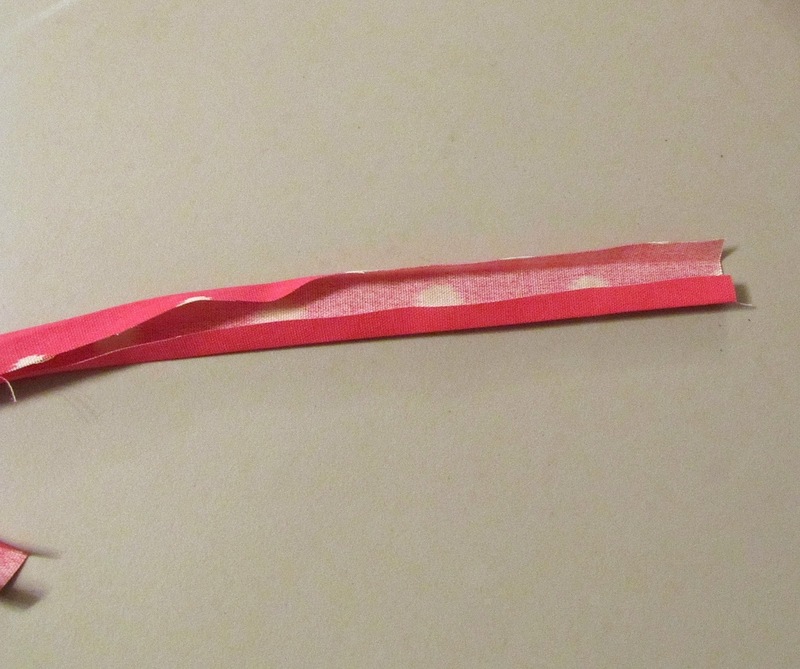 I placed the first one 4" from the top of the dowel rod with the folded edge pinned into the seam. 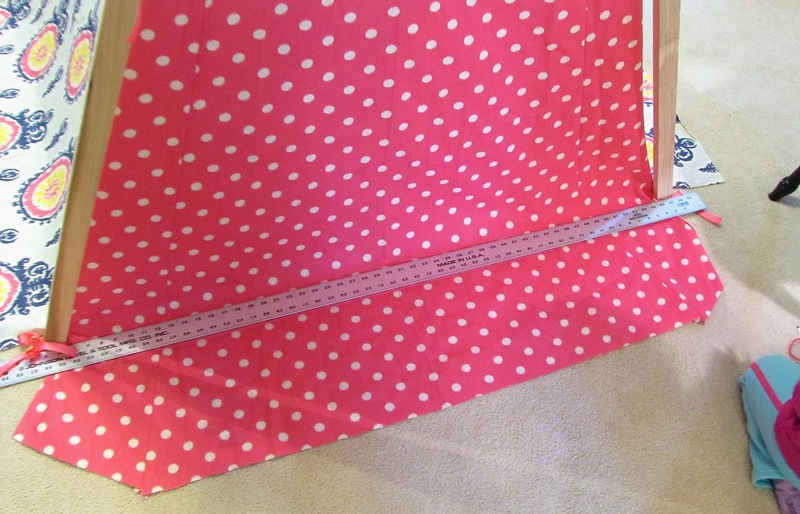 The middle ribbon is 33" from the top of the rod and the bottom ribbon is placed 62" from the top of the rod. 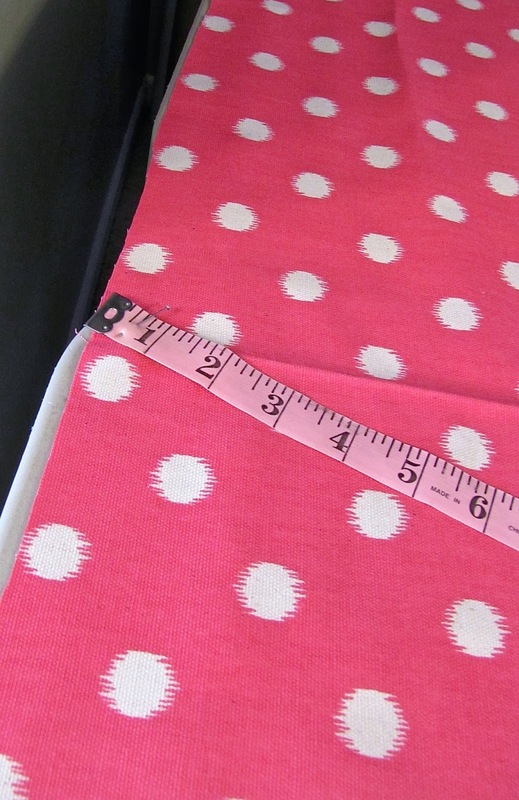 Sew them all at the same measurements in all 4 seams. 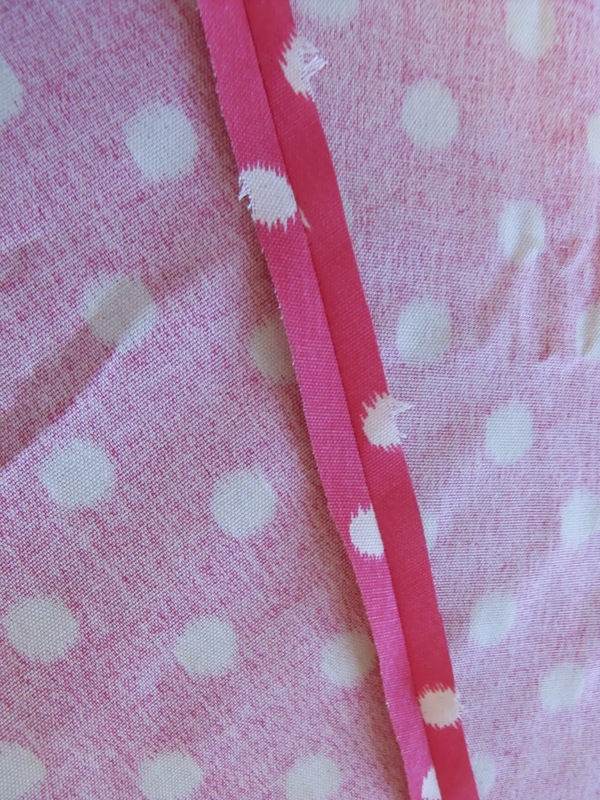 Here is a picture of the ribbon again so you can see how the fold is pinned into the seam. Here is a close up of the top of the triangle. 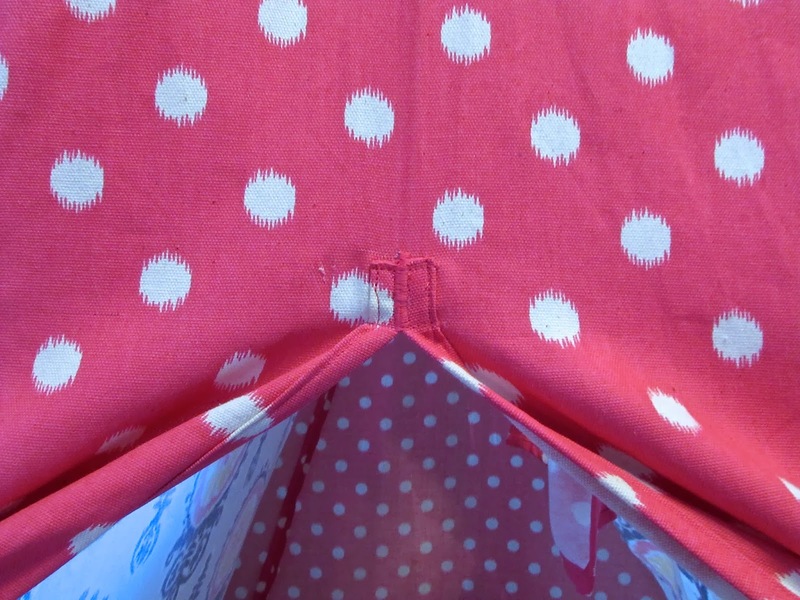 I stopped the stitching about an inch or so before the top to leave an opening for the rod. Once both of the triangle pieces have been sewn to the center piece along with the ribbons you can flip it right side out. I put the tent back on the frame and tied the ribbons in place. 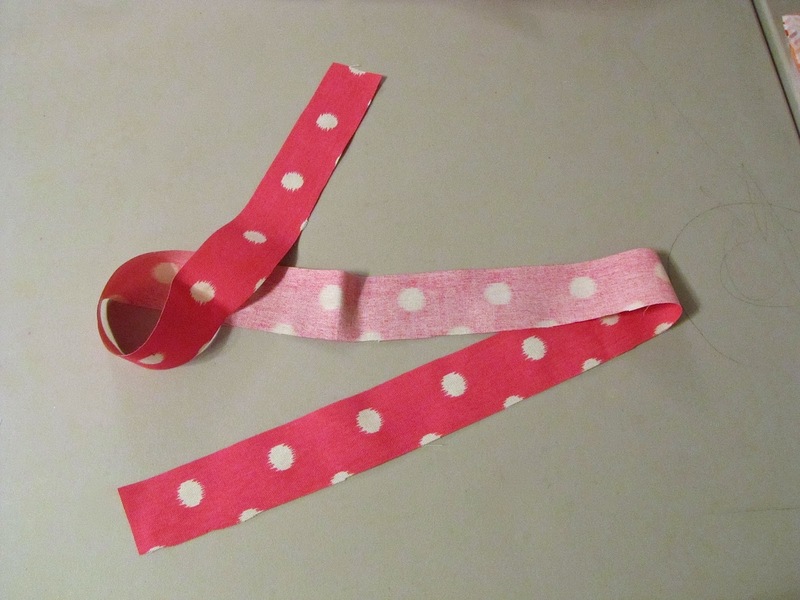 You can heat seal the edges of the ribbon with a lighter to prevent fraying. 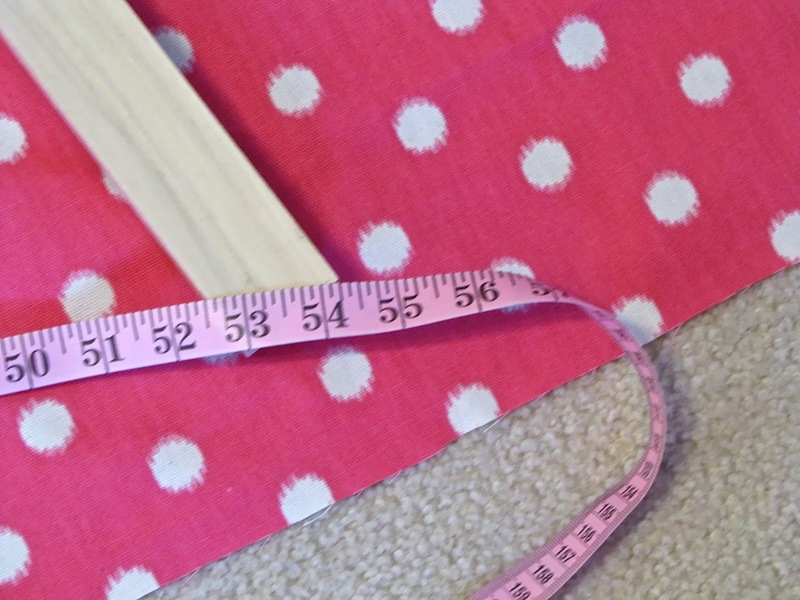 Measure down 20" from the rod and mark with a pin where the opening for the door will start. Starting at the bottom of the fabric I cut a slit in the center all the way up to the pin. I made bias tape out of some leftover fabric to cover the raw edges of the door. 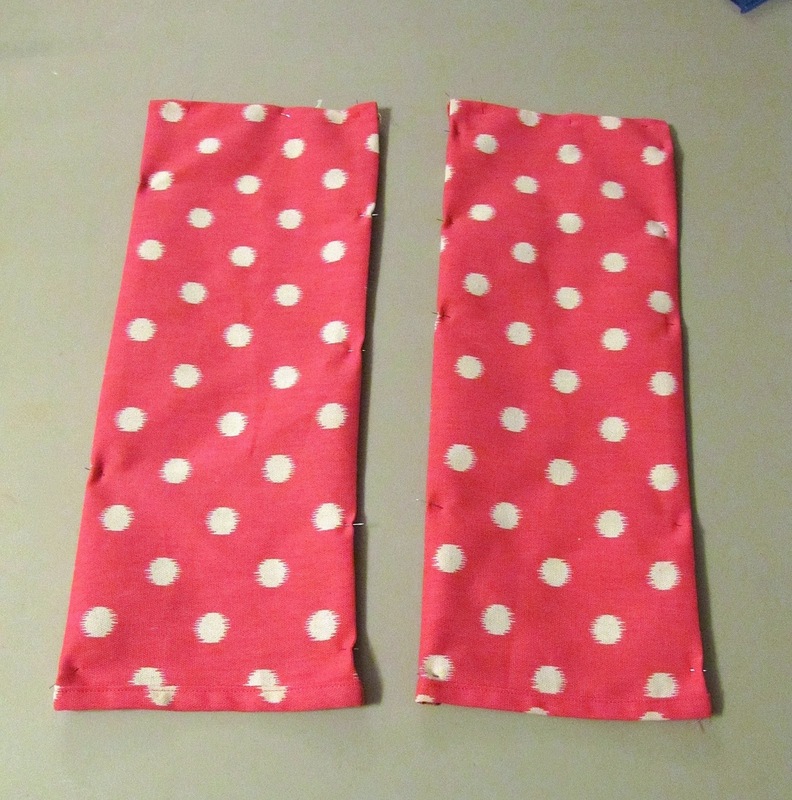 First, I cut out two strips each 2" wide by 50" long or however long it is from the top of the door to the bottom of the fabric. 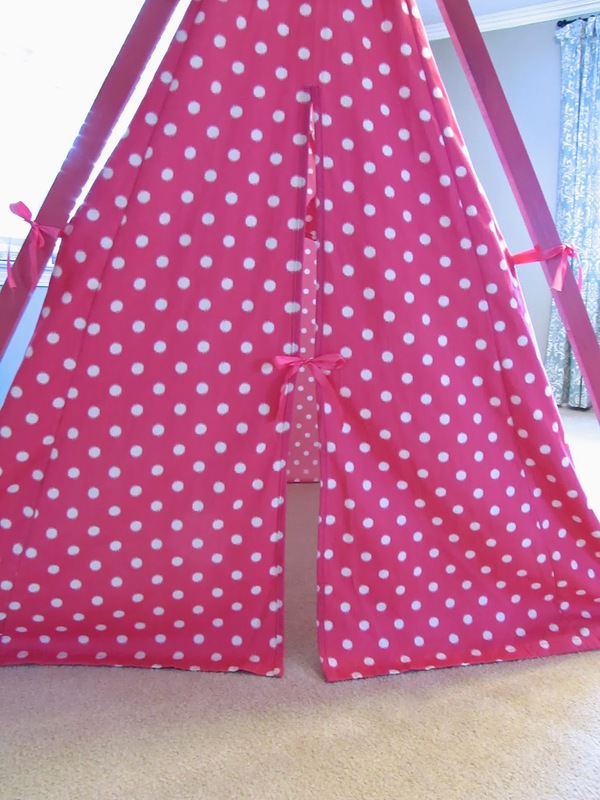 You will hem this when you hem the bottom of the tent. Fold it in half down the middle and iron flat. 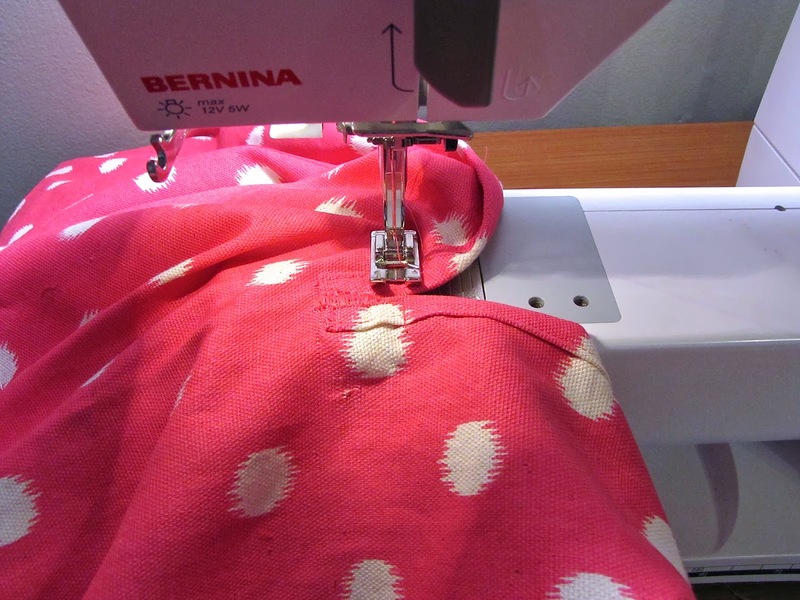 Now open it up again and take the edges and fold them in the middle with each seam touching the center. Iron it flat. Now fold them in half one last time and iron flat. 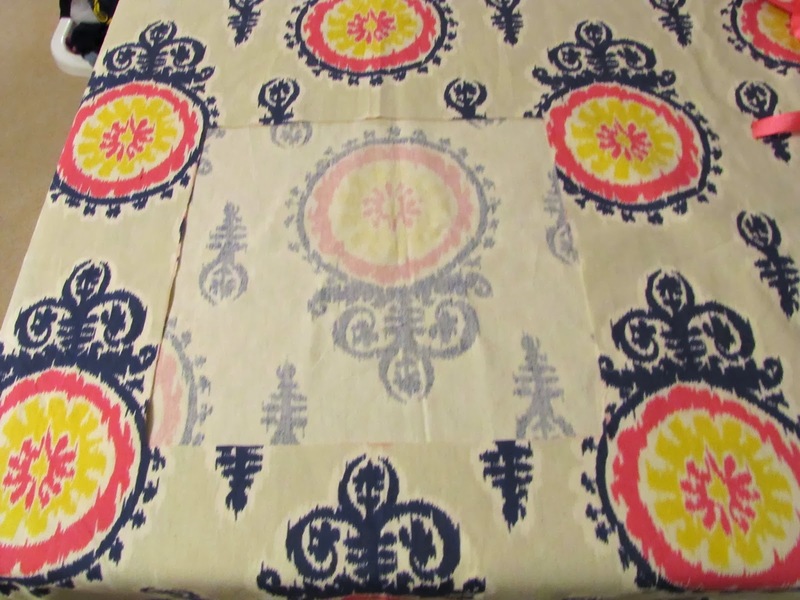 At the top of each of these I folded over the raw edge and ironed it down also. 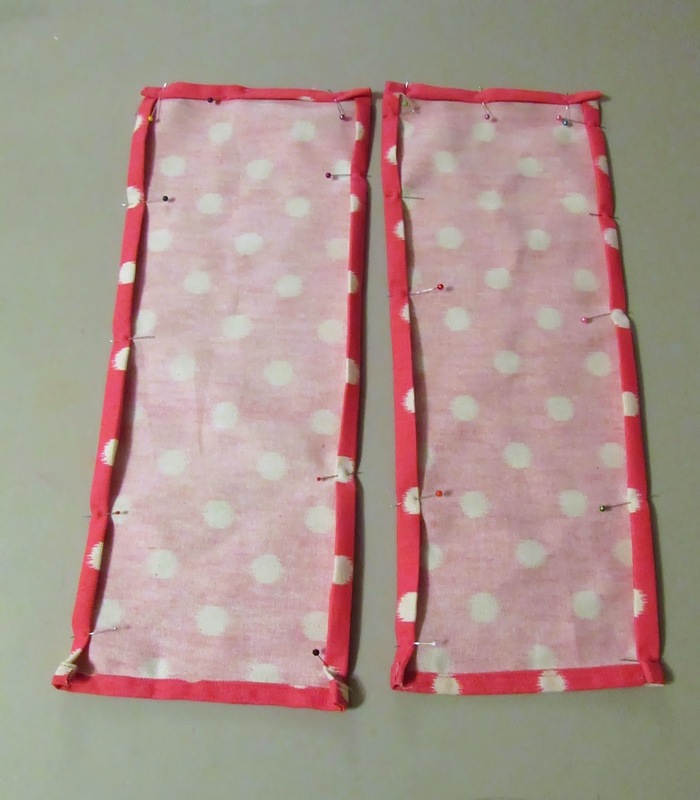 Now you will place them over the raw edges of the opening with the folded edge at the top and sew them in place close to the outer edge. To keep the opening from ripping I sewed a horizontal stitch across the binding about an inch from the top as seen in the photo below. 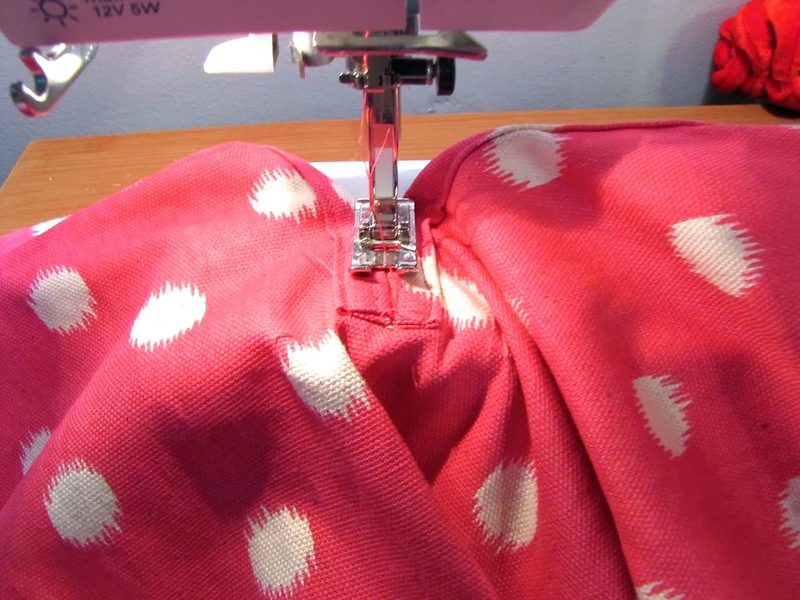 I sewed back and forth 3 or 4 times to secure. 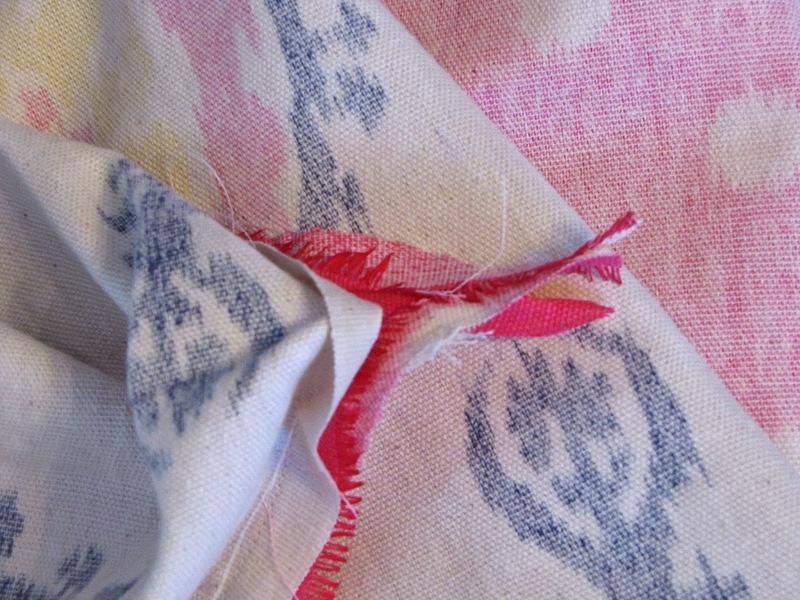 I sewed over the opening above it with a zigzag stitch. So in the end it will look like this. 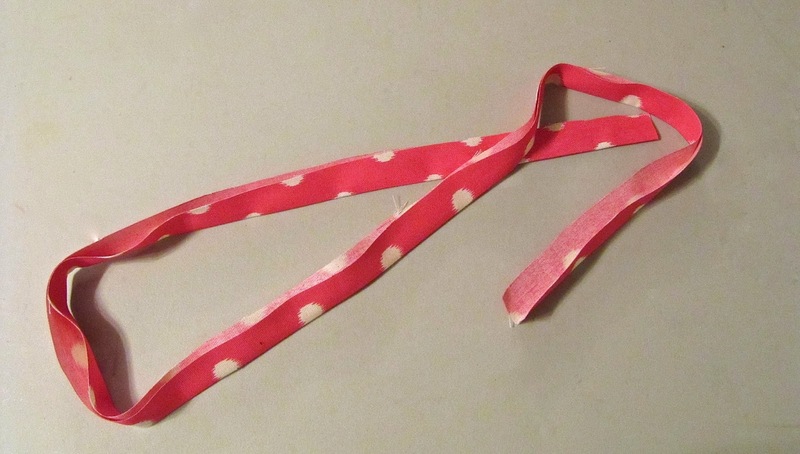 I sewed a piece of ribbon 15 1/2" down from the top of the door opening on each side to make the tie for the door. Now we are ready to hem it. 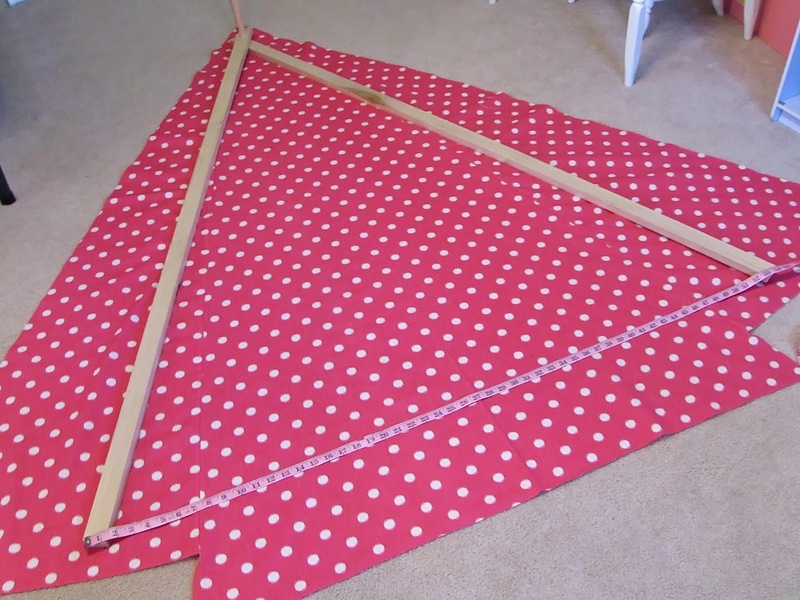 I took a yard stick and laid it on top of the fabric with the edge of the yard stick against the tent frame. Using a pencil I drew a line along the outer edge of the yard stick. (The edge not touching the frame legs.) The yard stick I used was 2" wide. Do the same thing to all four sides. You can faintly see my pencil line in this photo. Now onto the window. I was originally not planning to put a window in it but Maddy saw me working on it one day and kept asking where the window was. Apparently, hideouts are not as fun unless there is a window to stick your head out of. First, I drew out where I wanted my window to be. I centered it in the middle of the tent frame and started it about 13 1/2" from the top of the rod. 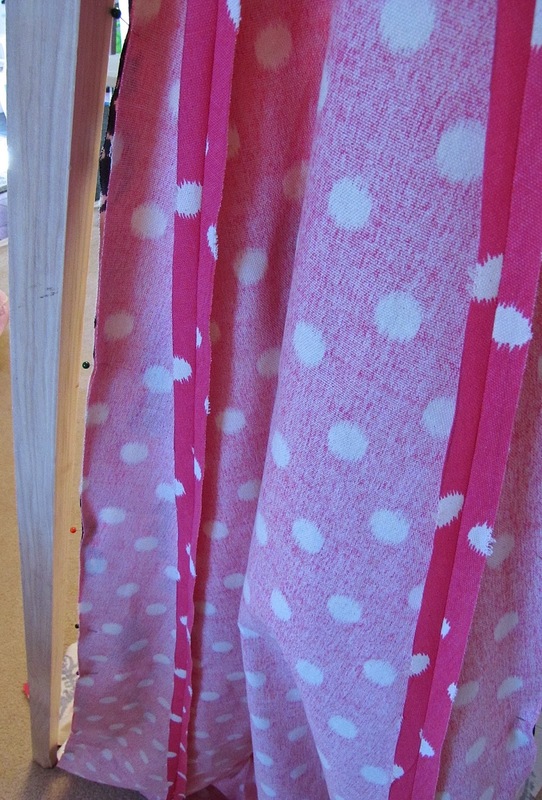 I made bias tape out of the extra fabric using the same method I used for the door opening. Pin it in place around the edges. 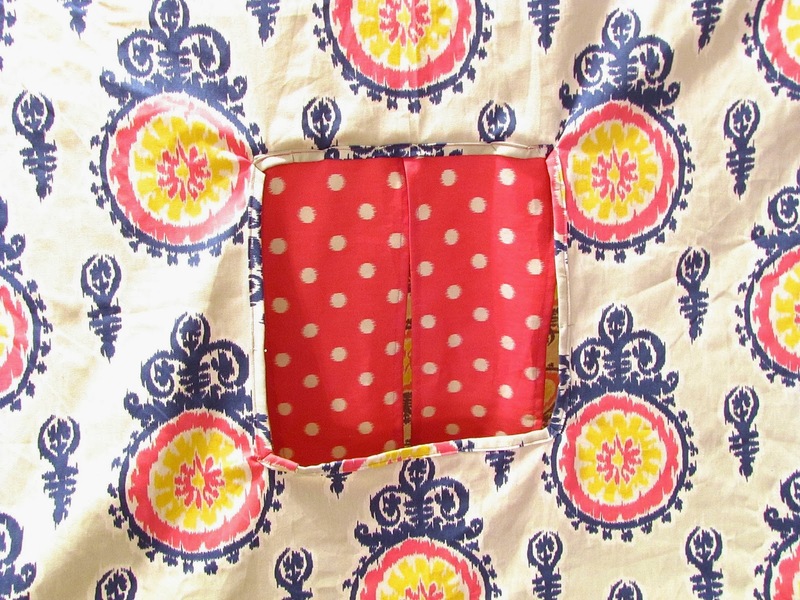 Sew it close to the opening on all sides. 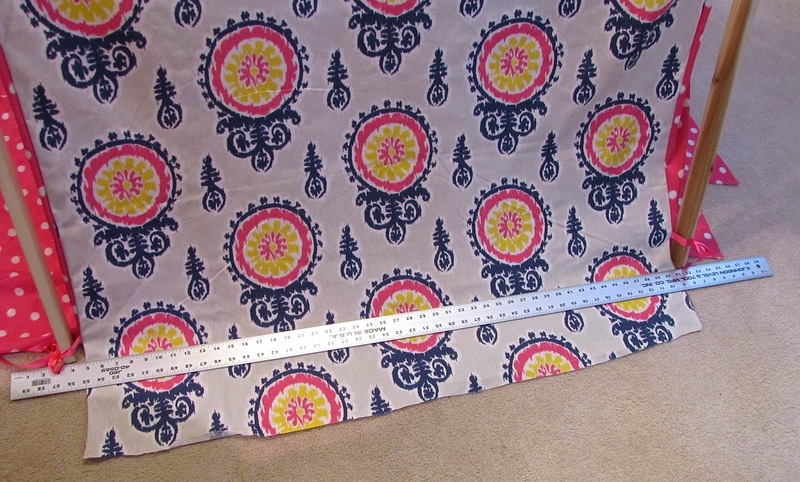 To make the curtains I cut out two rectangles measuring 7 1/2" by 18 1/2". 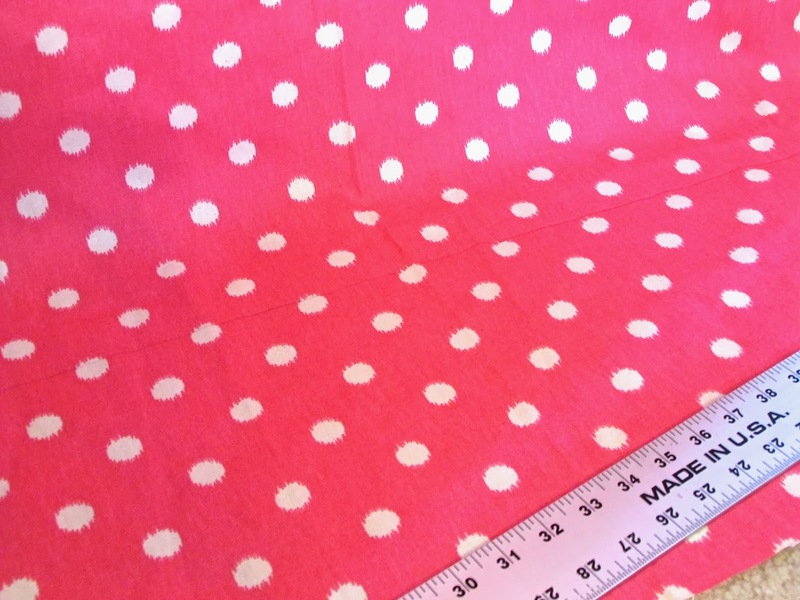 Fold over the edges half an inch twice to make the double fold hem and iron and pin in place. 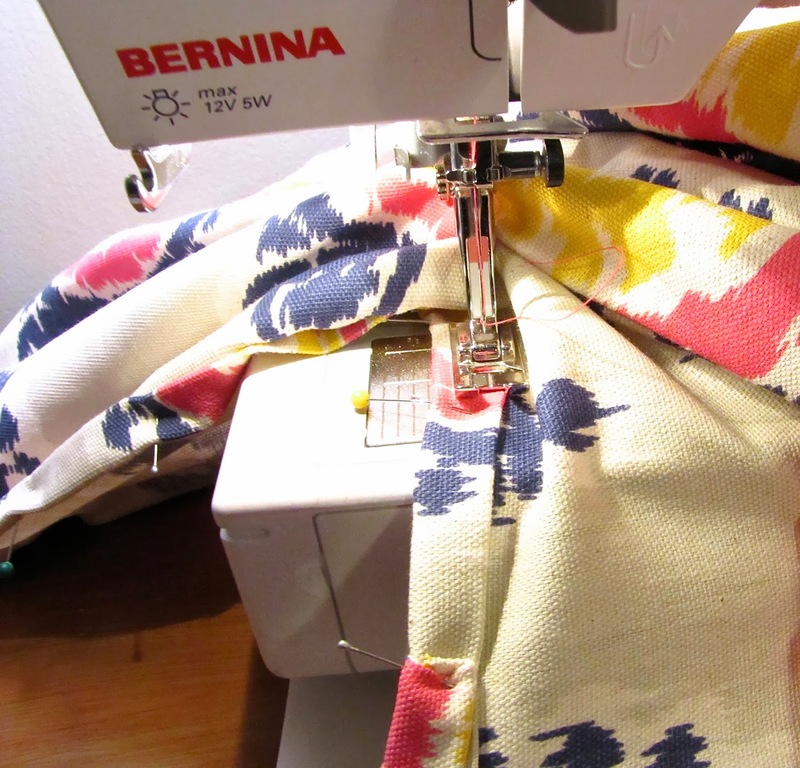 Sew along the edge to secure. From the inside of the window pin the curtains in place at the top and sew along the edge. It looks like this from the outside. I sewed two pieces of ribbon to the inside edges of each side of the window 7" down from the top to tie the curtains in place. 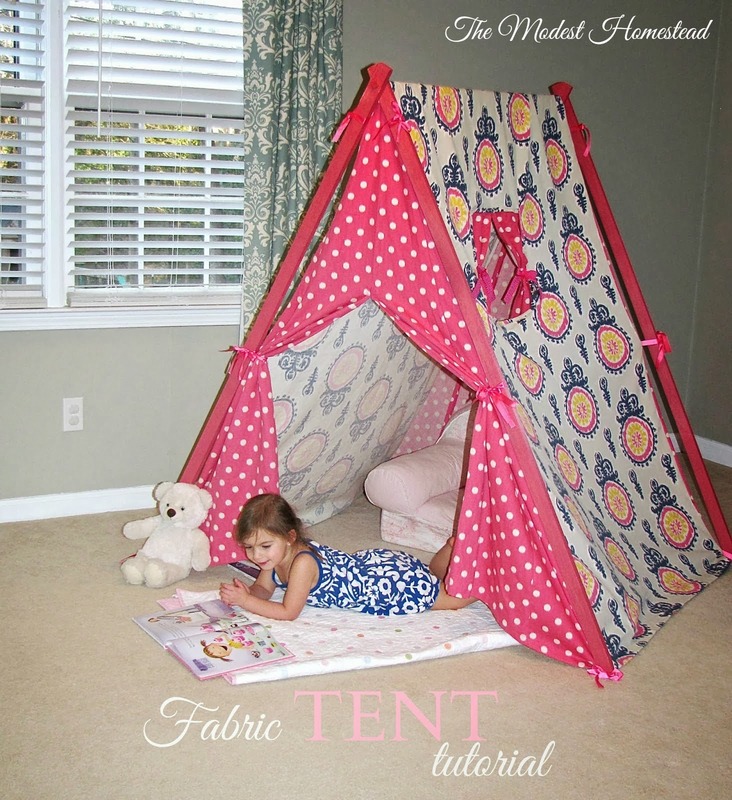 One good thing about this tent is it is very easy to store. For short term storage I can just fold up the legs of the tent and lean it up against the laundry room wall. 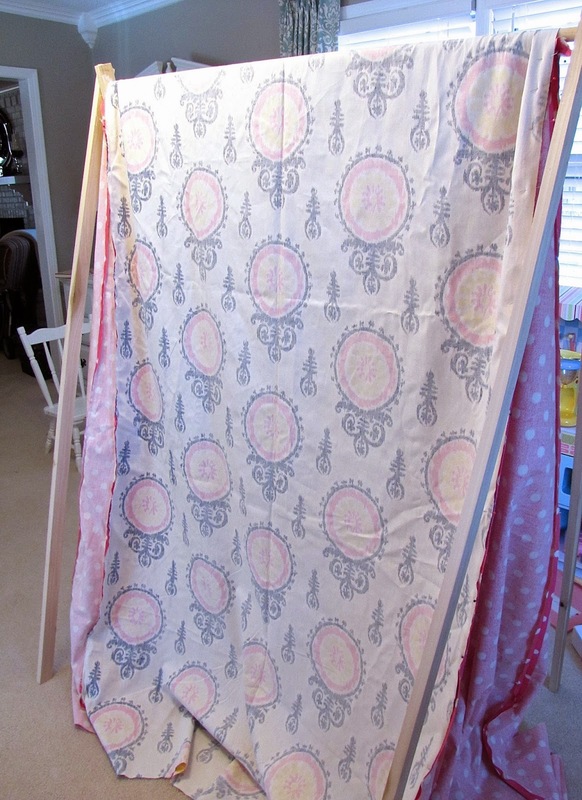 I can also pull apart the frame easily since the legs are not screwed in, fold up the fabric and slide it under a bed or in a closet. 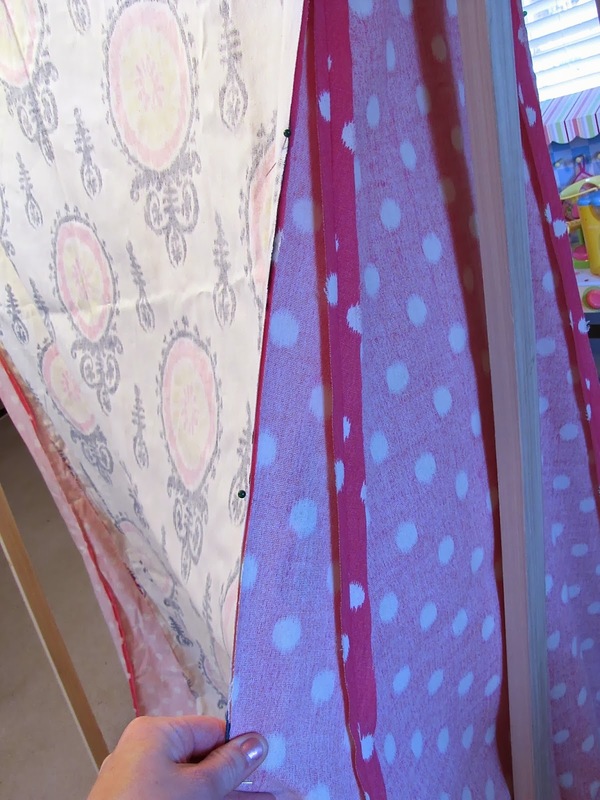 The kids have had lots of fun watching movies from their tent and hiding in it for hide and seek. And it has definitely come in handy lately as we have had lots of snow days! Linking up at The Inspiration Gallery with Craftberry Bush, Ella Claire Inspired and DIY Showoff. This is so cute! I love your fabric choices. 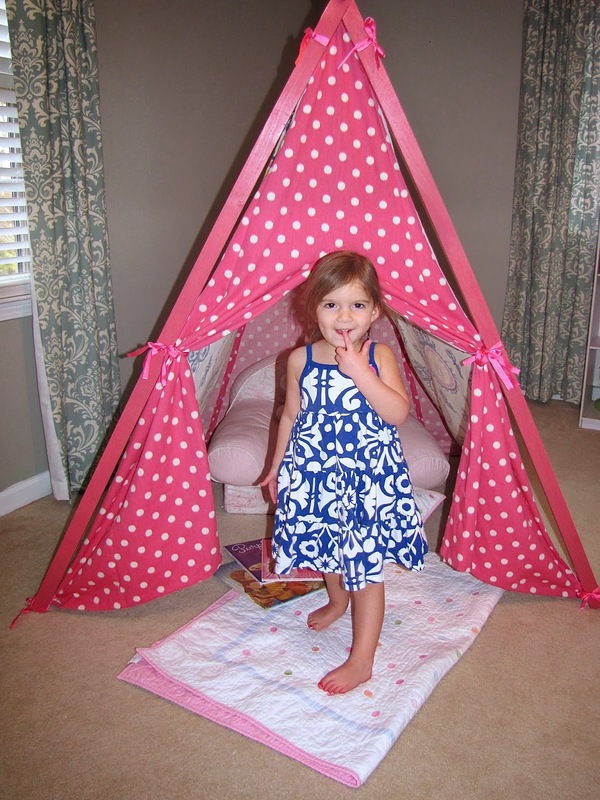 Very sweet idea, lovely fabric choices and I know my kids would love this, adding it to the 'to do' list! I love this! Maybe one day when we have more room I can make one for my kids. It looks very sturdy...The store bought ones are so cheaply made that if they pull on them at all, they bend out of shape. This is awesome!! You did an awesome job, thanks for sharing!! I love this! The fabrics are so bright and pretty, and it looks charming. I'm sure your kids absolutely love it. Would love for you to share at Fridays Unfolded!